Agricultural Data Interest Group (IGAD) participated through side meetings and in the RDA 8th Plenary Meeting. 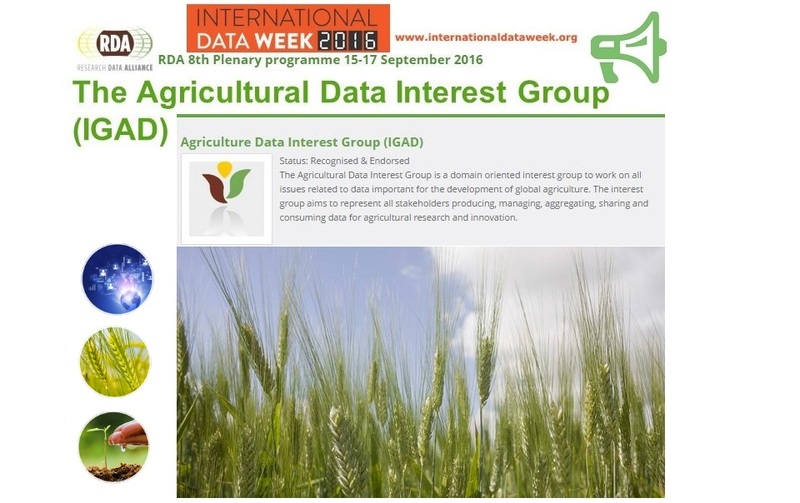 The Agricultural Data Interest Group (IGAD) was vibrant within the Research Data Alliance (RDA) 8th plenary’s umbrella of events. The RDA events were held on 15-17 September 2016 in Denver (CO), United States. This eighth edition of the RDA plenary was organised as one of the tripartite sub-events within the International Data Week (IDW) whose theme was ‘From Big Data to Open Data: Mobilizing the Data Revolution’. The other two sub-events were SciDataCon2016 (11-13 September 2016) and an International Data Forum (14 September 2016). Joint meeting of IGAD and Wheat Data Interoperability, Rice Data Interoperability, Agrisemantics and Soil Data Interoperability Working Groups (WGs). The IGAD panellists endeavoured to highlight the current challenges on research data management in specific domains, provided cases with examples, shared semantic solutions and reviewed policies that support these actions. Below is a summary of the two IGAD meetings that took place during that week. (v) variations in data consumptions and between published and archived data (due to gaps and differences in data extraction methods, and to error reporting data for a given date range). The second panellist was Ms. Erica Mehan Johns from the Mann Library of Cornell University. She presented the a joint effort between several key agencies within the USDA and the Mann Library at Cornell University. The USDA-ESMIS contains reports and datasets that cover both United States and international agriculture and related topics. Most data sets are in spreadsheet format and include time-series data updated yearly. In this repository, users can search for information according to geographic locations supported by geographic location ontology. (iii) using multiple avenues of communication (‘spreading the word’) to attract attention to the published data. ADAPT (implementation of a common object model and format conversion framework). (iii) to present the Wheat Data Interoperability guidelines / to discuss why and how to adopt them. While stressing the importance of symbiotic relationship between the RDA-IGAD WGs and the RDA-GODAN common goals and potential collaborations, Ms. Imma Subirats reported on the last 6 months activities of the IGAD. On behalf of Ms. Esther Dzale from Institut national de la recherche agronomique (INRA) it was highlighted the reasons for the creation of the Wheat Data Interoperability WG and explained its purpose and goals. For instance, the framework proposed by the WG consists of guidelines and tools which aim to promote the adoption of common standards, vocabularies and best practices for wheat data management. Afterwards, the panellist presented the talk entitled ’Wheat data interoperability guidelines: why and how to adopt them‘. (iii) that a globally coordinated rice research agenda warrants building a community framework ( standard) to easily exchange research data across the globe. Hence, the Rice Research Data Interoperability (RDI) WG was an outcome of this realisation (within the context of RDA), keeping in view the complexities of data (also gene annotations), information, and knowledge continuum of rice sector. The panellist then noted that the WG is working to identify relevant use cases, existing standards among rice research organizations, data formats, ontologies, standards and metadata, in order to produce a rice data framework specification, that is, a “cookbook” on how to produce ‘rice data’ that are aligned, easily sharable, reusable and interoperable across different data types. In this context, broader perspective across disciplines as well as digitizing existing information about rise research are needed. The AgriSemantics WG was presented on behalf of Ms. Sophie Aubin from the INRA. The goal of this WG is to promote the use of semantic assets (vocabularies, taxonomies, thesauri and ontology) to support better sharing and interoperability of agricultural data. The panellist then presented the Case Statement of the Working group which was reported to be under revision by the RDA Board. The Soil Data Interoperability WG was represented by Mr. Rainer Baritz (FAO, Global Soil Partnership/GSP secretariat) who focused his attention on ongoing work in the context of RDA and GODAN, and in particular on action plan of the Soil Data Interoperability WG. The Soil Data Interoperability WG (voted positively during RDA-Tokyo 2016) was established by 30 to 40 soil experts from Asia to promote the sharing of soil-related data through web services. To achieve pre-established goals, the WG is going to work closely with other initiatives (e.g., GSP, OGC, ISO and Soil ML Standard) related to the development of open soil standards, and to use the experience of content-related case studies supporting exchange and re-use of digital soil data. Mr. Adam Kriesberg (the current 2016/7 RDA/US Data Share Fellow from the University of Maryland College of Information Studies and USDA-ARS National Agricultural Library) presented the investigation of the place of Research Data in Agricultural Information Access Initiatives. This presentation summarised the recently undertaken a series of projects to increase access to agricultural information such as the Global Agricultural Concept Scheme (GACS) project, an international semantic web initiative which can link to and from related controlled vocabularies, helping to build a network of agricultural information resources. Mr. Kriesberg also reported on the RDA/US Data Share Fellowship project which examines the GACS initiative and collaboration on Linked Data and semantic vocabulary projects. Mr. Tomas F. Morris (Soil Nutrient Analysis Laboratory Department of Plant Science and Landscape Architecture, USA) and Mr.Nicolas Tremblay (Agriculture and Agri-Food Canada/Agriculture et Agroalimentaire, Canada) presented the proposal from the On-Farm Data Sharing (OFDS) WG. While stressing the importance of networks of farmers to evaluate (through data stewardship protocols) management practices at the field level, the panellists proposed to create a standardized (with harmonized (meta)data across data repositories)) set of open source protocols for data stewardship enabling the combining of results from many networks into one secure data pool. This latter would facilitate analyses of trusted data ‘across space and time’ by scientists, thus providing much more useful and robust answers to many questions about crop production practices and, consequently, increasing profitability and decreasing environmental pollution caused by food production. its scalable guidelines and solutions working already for a considerable part of global infrastructure for research data. After this discussion, a number of participants from different countries expressed their interest to join the OFDS WG, and to ‘spread the word’ about its action plan in their respective communities of practice. dubbed the upcoming 9th RDA Plenary Meeting an important event to trace further common vision/actions and coordinated approaches towards sustainable food and agriculture. Partnership between RDA and Global Open Data for Agriculture & Nutrition (GODAN) supporting proactive sharing of open data to make information about agriculture and nutrition available, accessible and usable to deal with the urgent challenge of ensuring world food security. (Note: as the RDA 8th overlapped with the GODAN Summit in New York, September 15-16, 2016, different IGAD members attended/contributed to this latter).